Almost every small town in Tuscany will be a delight to holiday in with kids. Car-free historical centers, good pizza, restaurant owners who adore children and local bars that sell ice-cream. But a place like Buonconvento even manages to have a few more extras to throw in. The beautiful little town is one of my favorite museum destinations to the south of Siena. And it's flat - which is a relief after all those Tuscan hilltop towns: you'll be at last able to wear your new high-heels - or who knows - you might even end up riding a bike. And it's a perfect place if you just want to hang out and do some people watching, as even in high-season Buonconvento is above all populated by Italians and not tourists. 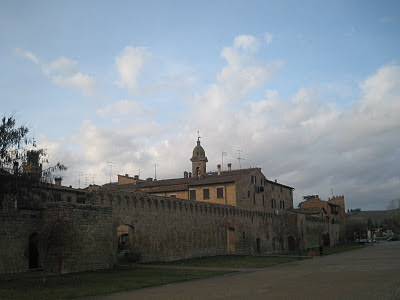 The Mezzadria Museo will introduce you to the Tuscan way of life during the tough times of share-cropping (mezzadria). The museum is especially designed to introduce Tuscan children (and not only them) in a playful way to the life their farming ancestors lived. The Museo d'Arte Sacra (sacred art museum) shows, what life in Southern Tuscany looked like for the more privileged people. The museum is situated in a wonderful building sporting plenty of frescoed ceilings and two original liberty bathrooms. This may not seem a great museum to visit with kids... until you explain them that the frescoes made up for not having touch screens and home cinemas. Once you're done with the museums, sightseeing and people watching, you can't miss out on a Tuscan meal at one of the town's lovely restaurants in the traffic-free town center. Perfect if you want to let loose the kids whilst you keep shoving down more Tuscan delicacies. Last but not least, it's time for some adults only pleasure. Fattoria La Resta is a little jewel of a winery in the hills just outside of Buonconvento. Vineyard owner Anna Lisa Tempestini speaks perfect English and has wide knowledge in regard to wine making in Tuscany (her husband runs Montalcino's Altesino winery). And no worries about the kids. They'll adore playing in the Renaissance courtyard of the Resta winery whilst you get down on the tasting. Museo d'Arte Sacra; phone: +39 0577 807190. Summer opening times: Thursday to Sunday 10am - 1pm and 3-6pm. Wednesday only from 3-6pm, closed on Monday and Tuesday. Fattoria la Resta; Tuscan winemaking at the doors of Montalcino. EVENTS: If you are happy to share the town with some other visitors - a great time to visit Buonconvento is during the yearly Festival della Trebbiatura (threshing festival) in July. HOW TO GET THERE: Exploring Tuscany with public transport? Buoconvento is a perfect destination then, as it can be easily reached with a 25 minutes train ride from Siena. The train station is a short walk from the historic town center. Check TRENITALIA for the current time table. If you travel by car just follow directions for the SS2 (Cassia) from Siena towards Montalcino.